Product: Dr. Argan Hair conditioning hair oil lines is based on argan oil rich in essential fatty acids such as Omega 6 and Vitamin E contains multiple toning, moisturizing, nourishing properties and repairing your hair health and extraordinary life. Products of instant absorption of the different layers of the hair for a wonderful result in the elimination of all damages and abuse hair maximum softness and health. High quality natural product for all hair types that counteract the effects of different processes such as bleaching, straightening, coloring or climatic effects. How to use: Apply to hair after styling uniformily or if you prefer, apply on hair before washing for 10 minutes in the hair dryer for maximum results. 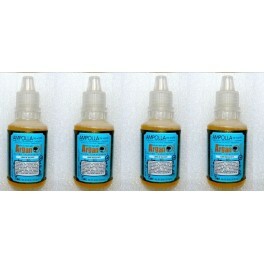 Natural Herbal medicine ampoule for hair growth. High shine conditioner and molecular reconstructor.